Not because it is a difficult process, but because there is very little information on how to do it to be found. And if you do find information, there are either missing steps in the process or require a certain amount of prior knowledge. 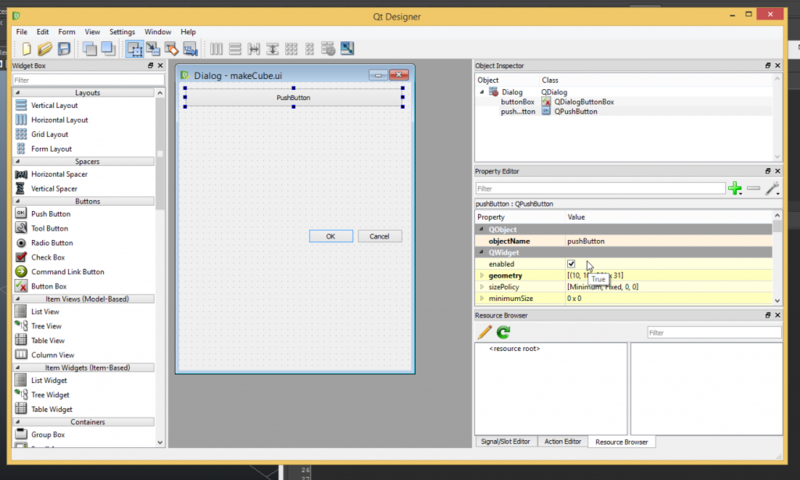 So here is a short overview on how to get a custom UI made with QT designer working in Maya 2014. For most people who just want to add some simple and clean layouts to their scripts this will be the first big hurdle and often be the point where they just give up. You need to download a couple of files, place them in specific locations and then run those scripts. All nice and simple but this is a very annoying and painful configuration where many things often can go wrong. Not only that but you also need a copy of Visual Studio to be able to run these scripts in order to run and compile the plugins. Instead of all of this trouble we will use PySide instead of PyQt as it comes with Maya 2014 and will not require all of that hassle. There will be some syntax difference between the two. But some a quick Google search should often help you adjust for example a tutorial script from PyQt to the equivalent PySide code . I am not going to go over this step as this is a rather straight forward part of the whole process. Maya 2014 allready comes with a version of QT designer and can be found under the QT folder of your Maya 2014 install. Here is an image of the UI used for the scripts in this tutorial. As you can see, the .ui file is nothing more than a xml file describing the different elements of your UI. To be able to use this information inside of Maya we will need to convert this file to a Python script. This will allow Maya to automatically find your script file once converted. Here is a small excerpt from that site explaining the core of setting this up. “To create a package, create a folder in one of you PYTHONPATH directories like your Maya script directory, then create a file called __init__.py inside of that new folder. The __init__.py can be empty. You can then place your modules into that package and import them as follows. You can have packages inside of packages. Any code you put in the __init__.py file of a package gets executed with the package. For example, in the above sample package hierarchy, I could have code in scripts/cvtools/__init__.py to create a Maya menu when the package is imported. In our case we converted the makeCube.ui file to a makeCube.py file. Giving us the following piece of code. Note how you can see all the elements that were part of our UI neatly defined. How do we access the UI script? This tells us where we can find our UI script. Using customUI we can then access the different UI elements. How do we assign the UI class? After setting up what ui we will be using we call the setupUI function. Notice how this function was also present in the converted .ui script. How do we use our UI elements? This piece of code will determine what will happen when you the “clicked” event gets called on the button with the name “pushButton”. Bellow that we have defined the function to which we are referring. In this case, whenever someone presses the “pushButton” button the console will print the defined text. I hope that this tutorial will be of use to some people. I am not a Maya user myself and this tutorial is the result of me trying to help a friend to get all of this to work. It took us multiple hours and different attempts to find a fully working solution. Going over multiple tutorials and solutions, each either with errors, legacy code, crucial parts missing, no explanation on how to perform certain steps or what you are actually doing. So therefore this complete step by step overview of how we got a QT designer GUI to work inside of Autodesk’s Maya 2014 using PySide. Thank you so much for this, was as you say pulling my hair out trying to get a Qt interface to work. Was just about to give up and go back to hand Coding a Mel one. Hello, how do I import a Maya animation for Qt creator? Someone would have any examples to help me? This was really helpful!!!! Thanks! Thx for adding this info! Thank you so much for this tutorial. I had no idea how to use my converted UI file and learned so much from this post. Thanks again! Not sure what you mean with this. As far as I know, in order to make use of the designer qt file in maya you need to convert it. The qt file itself is just a xml file generated by qt designer based on your design made with the visual editor. How can I display a image from y QT Interface to Maya? Hope that that fixes your problem. Thank you. Glad I could help!